A hallmark of the central room in an Econest home, the "mandala ceiling grid" provides an elegant way to suspend a set of rice paper screens that diffuse the daylight from skylights above. The effect on the room is a calming natural light, devoid of harsh shadows and strong glare. 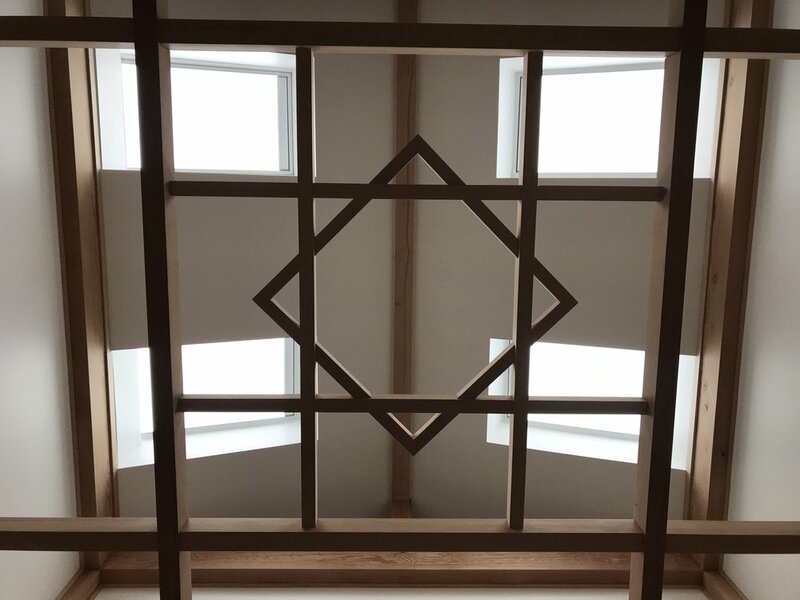 Traditionally the ceiling is constructed as a "major mandala" grid within which is a similar "minor grid," in this design, however, our clients requested to include a tertiary element: a rotated square to form an eight pointed star. This provided an exciting challenge and opportunity for careful joinery. As with many of our projects, we begin with a CAD model to allow the client (and craftsman for that matter) to visualize the completed work in three dimensions. The equally important benefit is removing error and delays by working things out on the computer. The central square of the mandala ceiling is rotated 45 degrees to achieve a star pattern. 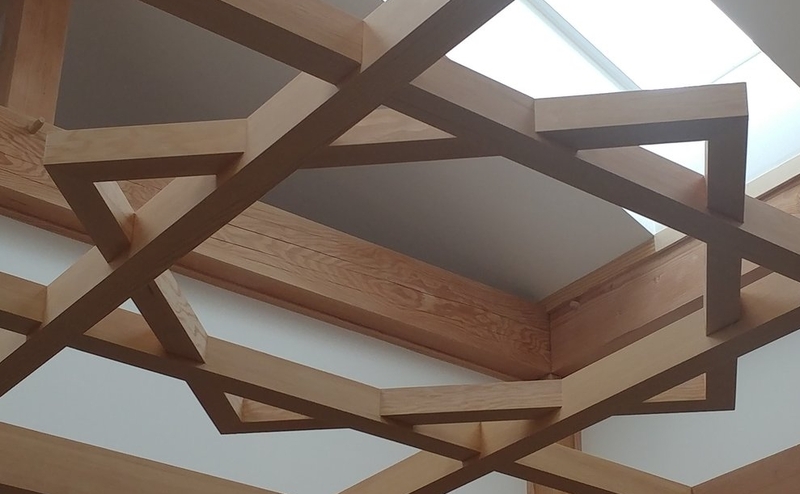 In keeping with the traditional timber frame construction of the rest of the ceiling, half lap joints were cut with slight setbacks into the timbers. This ensures that there are uniform seams along the joints between members. The eight pointed star, composed of two equal squares at 45 degrees to each other is known as the Rub el Hizb (ربع الحزب) which is an auspicious symbol in the Islamic tradition. It has the added benefit of acting like a compass as the home is roughly oriented with each point indicating a cardinal direction.